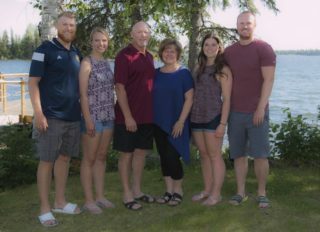 (Courtesy of Perry Bergson, The Brandon Sun) — Todd Lumbard has had wonderful success in his business and personal life. He’s also enjoyed it in hockey. Now 55, the married father of three said the game had an outsized impact on everything that would come later. “It was probably the most significant part of my growing up years,” Lumbard said. “Basically most of my friends were my hockey friends and I was learning life lessons from coaches. Like so many kids, I went to bed thinking about hockey and woke up in the morning thinking about hockey. It was a huge part of my life. 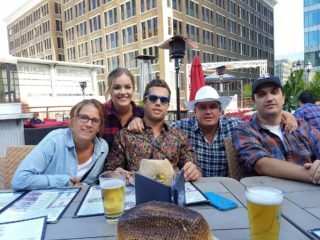 Lumbard was born and raised in Brandon alongside siblings Wade and Becky. He started to skate around age four, spending plenty of time at the nearby Valleyview Community Centre as he grew up. Both of his parents, father Jack and mother Joyce, were involved at the community centre, with Jack on the board of directors and pitching in to repair things like the boards. Lumbard’s parents were enormously encouraging, always doing the little things like helping him get to the rink. That was sometimes a bigger job than expected because Lumbard liked to hang around the dressing room and chat with his teammates, and when he got older, he would sometimes stay for an extra ice time with a senior men’s team if they were short a goalie. He doesn’t remember playing anything but goal, but does recall liking it right away. His earliest memories of playing serious hockey are with the eight-year-old Little Wheat Kings when he was the only goalie. As a youngster growing up in Brandon, he was also a massive fan of the Western Hockey League’s Wheat Kings. 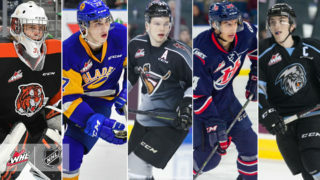 He also remembers watching them at the Manex Arena, and sneaking through an unlocked door with his dad one day to get an advance look at the nearly completed Keystone Centre. Lumbard has clear memories of Brian Propp and that group when they came to Brandon, and attending the Dunc McCallum and Andy Murray hockey schools. His favourite player was a fellow Brandon goalie, Glen Hanlon. 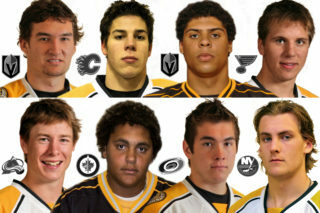 Lumbard played all of his minor hockey in Brandon until he turned 16. After attending Wheat Kings camp and spending three weeks with the Manitoba Junior Hockey League’s Brandon Travellers, he joined the Notre Dame Hounds for the 1979-80 season for the chance to be on the ice every day. He earned the backup job with the Wheat Kings a season later — beating out a pair of 16-year-old prospects named Ron Hextall and Ken Wreggett — and appeared in 28 games in the 1980-81 season behind starter Ron Popplestone. Lumbard said Popplestone, who he roomed with on the road, was a terrific mentor. Don Dietrich was another guy who took the younger players under his wing. Lumbard admits there was some pressure involved for him, both because of the scrutiny that comes with playing the position and the fact he was doing it in Brandon. “Any kid who’s playing in their hometown, it’s a different experience,” Lumbard said. “When you’re young I’m not sure it necessarily hits you as much as when you think back on it as an adult. It was a very different era of the game, with a premium on offence and very few defensive systems. The Prince Albert Raiders led the league with 307 goals this season: In 1980-81, they would have ranked 10th in a 13-team league. In that context, Lumbard’s 4.52 goals-against average and .882 save percentage were respectable numbers. He apparently impressed National Hockey League scouts. In the 1984 draft, he was taken in the fourth round, 84th overall, by the New York Islanders. He had earlier heard rumblings the Winnipeg Jets might draft him with the 85th pick. He was in Grade 12 at Neelin and thinks it was a Brandon Sun sports writer who told him the news. With Popplestone’s departure after Lumbard’s first season, the Brandonite would become the starter in 1981-82 with Hextall as his backup. He appeared in 54 games, with a 5.66 goals-against average and an .851 save percentage. They were then swept by the Regina Pats in the playoffs. 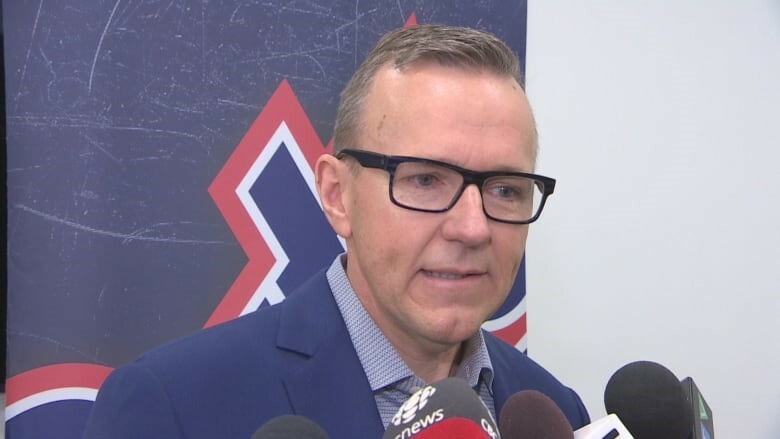 Lumbard said Hextall, who became a good friend too, was a raw athlete who was developing into the outstanding goaltender he would eventually become. Part of that growth came in the off-season when the 19-year-old Lumbard was shipped to Regina for Barry Trotz, Bruce Holloway, Grant Jennings and a player to be named later to allow Hextall to become the starter. While Brandon would miss the playoffs in 1982-83, Lumbard had a tremendous season with the powerful Pats. In 56 games, he posted a career-best 3.64 goals-against average and an .885 save percentage with a pair of shutouts. The Pats were eliminated in the division semifinals, but Lumbard was selected to the league’s second all-star team. He turned pro in his overage season, spending time with the Peoria Prancers and Toledo Goaldiggers of the International Hockey League and the Indianapolis Checkers of the Central Hockey League. Lumbard’s ticket to the NHL would come in an unlikely fashion. On Jan. 13, 1985, Islanders starter Billy Smith swung his stick at Curt Fraser of the Chicago Blackhawks and broke the forward’s jaw. Smith received a six-game suspension for the violent incident and Lumbard was summoned to back up Kelly Hrudey. Lumbard dressed for six games stretching from Jan. 29 to Feb. 9 but never actually played. It would prove to be his only taste of the NHL. “When you’re playing in the minors — and I really enjoyed my time in pro — when you get called up to the big team there are just so many different emotions,” Lumbard said. “You just look around you and it’s so different. You’re in bigger arenas and you’re flying everywhere. It’s just a really high-end experience that you’re in and that’s what you’re striving for. I think it was a little bittersweet for me in a way because I knew I was only there for six games and I was a little unsure if I would make it back. After one more season in 1985-86, Lumbard decided to retire. A couple of factors played into his decision. First, he chatted with another goalie who was preparing to hang up his pads, and since Lumbard was in the final year of his contract, that twigged something in his mind for the first time. “I had bounced around the minors a bit and never really captured the level of play that I had in junior,” Lumbard said. Then Lumbard’s father told Todd that he was welcome to join him at the Brockie Donovan Funeral Home, which Jack had owned since 1975. Todd didn’t want to bounce around the minors for years, so he hung up his skates. Lumbard, who left the game healthy, went to university for a while thinking a business degree might help, but his dad needed him to become a full-time employee so he returned to the family business. Brandon also benefited from Lumbard’s return, as he quickly displayed a sense of community and volunteerism upon his return. As president of the Brandon Chamber of Commerce, he felt compelled to throw his hat into the ring to serve on city council, which he did from 1998 to 2002. In 2004, Lumbard purchased one of Regina’s oldest businesses, Speers Funeral and Cremation Services, and he, along with wife Kerry, daughter Drew and sons Brock and Luke, moved to the Queen City. Lumbard still has an interest in Brockie Donovan, and with his family here — Jack died on March 20, 2014 —he’s in Brandon a lot. “They’re my co-hometowns now,” he chuckled. He’s also found a way to return to the WHL. Lumbard and his friend Anthony Marquart had chatted about potentially buying the Pats from Russ and Diane Parker one day. When the Parkers agreed to sell, the duo added partners Jason Drummond, Shaun Semple and Gavin Semple and the five formed an ownership group that purchased the club in 2014. “It’s been very nice,” Lumbard said. “Hockey is always in your blood. As Canadians, that’s what we do. I always have thought ‘How can I get back involved in hockey?’ and with my business life and knowing that I’m not cut out to be a coach or general manager or scout —those guys are great at what they do and have skillsets that I don’t have — so I figured it was probably going to be ownership or nothing at all. To have the opportunity to be back involved with the western league and be back involved with hockey has been great. Lumbard has a chance to speak to the team occasionally, and likes to tell the players that their junior careers will go by quickly, and that they need to take the time to enjoy it. He also says it’s important that they put the work in so that they won’t one day be filled with regrets about what could have been. He never tells them to win.